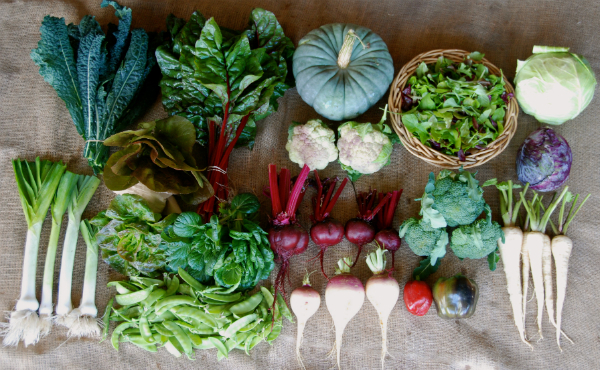 LAST WEEK OF THE AUTUMN SHARE AND OUR 2012-2013 CSA! WOW! This is week #13 of the Autumn Share and week #26 of our CSA. We thank you for your support, for enjoying local food, for sharing your food inspirations and thoughts on this service and for eating so many different types of turnips! NOTES ON STORING THE HARVEST Please check out our Vegetable & Fruit page on the website to find tips on maximizing the life of your veggies. We envisage that many of the vegetables you are receiving this week will last for two weeks with careful attention to storing upon arrival. NOTES ON THE SHARE Beet Root – Harvesting bunches of 'Bulls Blood' and 'Ruby Queen'. Broccoli – Harvesting heads from a new planting 'Marathon'. There will not be the surplus of last week but there should be a head in every box. 'Romanesco' Broccoli - This is more like a cauliflower then a broccoli. The lovely lime green spirals are tender with a slightly nutty flavor. Delicious raw. Use as you would cauliflower or broccoli. The planting teases us with a few heads every week. If you have something in your box that looks like an "Escher" painting with spirals inside spirals, its 'Romanesco'. Green Cabbage - 'Green Acre' Cauliflower - The plantings of 'Green Macerata' and 'Sicily Purple' cauliflower are continuing to produce heads ready for harvest. There is also a planting of white cauliflower 'Early Snowball' heading up. Kale – Harvesting bunches of 'Nero di Toscana', 'Red Russian' and 'Dwarf Blue Curled'. Leeks – We have cleared out all the leeks and will be dividing them between all the boxes. Lettuce – Harvesting lovely small heads of 'Brown Mignonette', 'Brown Cos' and 'Green Mignonette'. Mesclun – Harvesting a lovely mix of baby "greens". Parsnips – ‘Guernsey’. We have cleared out the planting and hope to include some parsnips in every box. Peas – Harvesting 'Oregon Giant' Snow Peas. Pumpkin – 'Queensland Blue' and 'Hercules Butternut'. Silver Beet – Harvesting bunches of 'Red Ruby'. Swedes – A Vermont favourite, known as a 'Rutabega' in those parts, are a wonderful addition to stews. While these may look a bit like a turnip, they are frost resistant and have a sweet, mild flavour when roasted. Tat Soi – Harvest bunches of this Asian green great raw or lightly braised. NOTES ON WHAT IS GROWING With this being the last box of this CSA season, we ask that you let us know what you have thought of this service. Were the boxes too big, too small, too diverse, not enough of each item, perfect every week? Were there items you would have liked more often, items you would have liked less often or ones you would have prefered not to have? The difference between being part of a CSA and buying food from markets, growers shops, and grocery stores is that we are your farmers. We are growing the food for YOU. So please tell us what you think now while we have the time to change our program for next year. Emailing us at petercarlyon@gmail.com . Our harvesting will begin again in the Spring. We will be contacting you over the winter to see if you would like to be a part of our CSA then. Thank you for your support!! We are enjoying the direct relationship we have had growing your food.